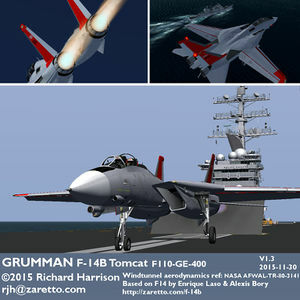 The Grumman F-14 Tomcat is a fourth-generation, supersonic, twinjet, two-seat, variable-sweep wing fighter aircraft. 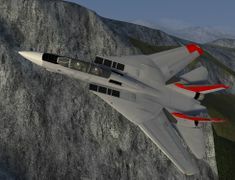 The Tomcat was developed for the United States Navy's Naval Fighter Experimental (VFX) program following the collapse of the F-111B project. The F-14 was the first of the American teen-series fighters, which were designed incorporating the experience of air combat against MiG fighters during the Vietnam War. The F-14 first flew in December 1970 and made its first deployment in 1974 with the U.S. Navy aboard USS Enterprise (CVN-65), replacing the McDonnell Douglas F-4 Phantom II. The F-14 served as the U.S. Navy's primary maritime air superiority fighter, fleet defense interceptor and tactical reconnaissance platform. In the 1990s, it added the Low Altitude Navigation and Targeting Infrared for Night (LANTIRN ) pod system and began performing precision ground-attack missions. 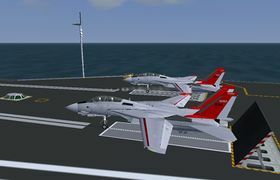 The Tomcat was retired from the U.S. Navy's active fleet on 22 September 2006, having been supplanted by the Boeing F/A-18E and F Super Hornets. As of early 2015, the F-14 is in service with only the Islamic Republic of Iran Air Force, having been exported to Iran in 1976, when the U.S. had amicable diplomatic relations with Iran. 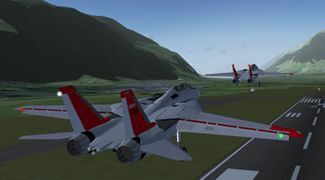 There are two variants modeled in FlightGear, both available in FGADDON. F-14B with the GE F110-GE400 engines improving power and reliability. 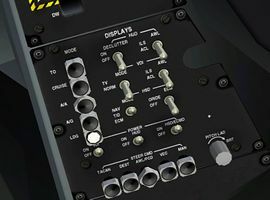 The F-14 uses a Vertical Display Indicator (VDI) as the primary attitude reference instrument; there is a standby ADI just to the right. AP CPLR - displayed when system operating and within correct altitude. The AP CPLR system is not available. WAVE OFF - displayed when landing should be aborted as outside of the parameters for a good landing. The AoA Indexer has three lights; out of which up to two can be shown at any one time. These lights are illuminated whenever the gear is down. If the indexer lights flash it indicates that the hook isn't down; unless the HOOK-BYPASS switch on the right console is selected in which case the lights will always be steady. Red upside down V Airspeed FAST: AoA too low (below 14°). The airspeed guidance is secondary; it is the AoA that is important. BRAKES - Wheel brakes are engaged; ⇧ Shift+b to disengage. AUTO THROT - APC has disengaged abnormally. There is a set of caution warnings that can be shown on the panel on the left console. When a light illuminates on the caution panel the MASTER CAUTION on the glareshield will also illuminate until pushed. Once pushed the caution panel warning will remain and the MASTER CAUTION light will be extinguished. OIL PRESS - oil pressure on at least one engine is below the minimum. Use to control the cabin pressure and temperature. Cabin pressure will be maintained according to the correct schedule. Using Cabin press dump will de-pressurise the cabin. Air source needs to be selected to allow cabin pressure and windshield air to function. The windshield air can be used to clear the windshield from frost and internal fogging. Illuminates warnings using different colours to indicate severity; cautions are orange and advisories are lighter. Used control the engine generators and the emergency hydraulically powered electrical generator. Setting the Emerg generator to off and turning both generators off will result in no electrical power to the aircraft even when both engines are running. Use to shutoff the emergency transfer between the two hydraulic systems. If you have the an engine shutdown the hydraulic system will be powered by this pump; if you set the pump to SHUTOFF then the hydraulic system for the shutdown engine will have no pressure. Ctrl+q Toggles Radar Standby Mode. In standby mode the radar doesn't emit and the "STAND BY" words are displayed on the HSD screen when in TID mode. 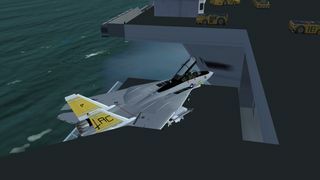 See also Howto:Carrier, Carrier over MP as well as a detailed carrier landing howto for the F-14 Tomcat. 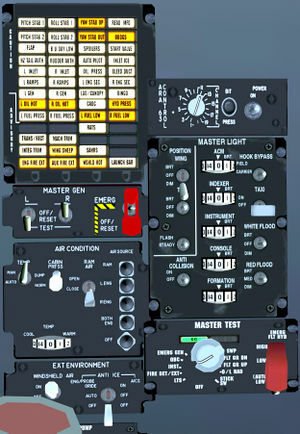 Ctrl+w Cycle through master arm switch modes (see master arm switch in cockpit). w Cycle Stick Weapon Mode Selector (see Weapon Mode knob selector on side of joystick in cockpit). Four positions: Off, Gun, SW, SP-PH. 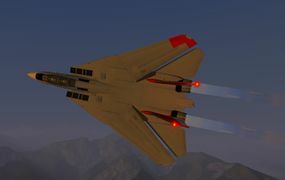 The F-14 has three different types of lift augmentation on the wings. Flaps, Auxiliary Flaps and Slats. Maneuvering flaps and slats are automatically activated by the CADC to improve performance at high AoA and lower speeds. The maneuvering flaps are disabled when wings are swept outside of the permissible region for flap or slat deployment. In the picture the slats are at the front, the spoilers on the top, and the flaps at the back. The auxiliary flaps are next to the fuselage and the main flaps are behind and below the spoilers. Full aerodynamic affects of wing sweep are modelled. 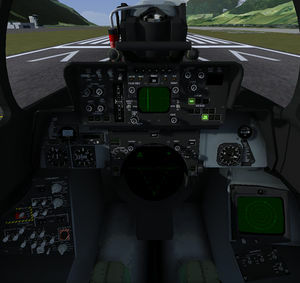 The Wing Sweep can be controlled via the keyboard or by using the Sweep gauge in the cockpit. Use the mousewheel over the sweep angle indication to adjust the required angle of sweep. 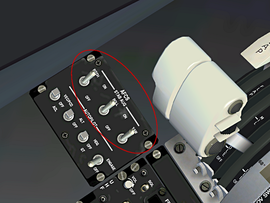 The legends to the right of the wing sweep gauge can be clicked to any of the possible modes. The CADC will provide automatic wing sweep based on Mach number. The wings cannot be swept further forwards than the CADC automatic value (to protect the airframe). The main flaps operate until the wings are swept to 55 degrees; the auxiliary flaps are only available with the wings swept to 22 degrees. Interlocks operate to prevent flap deployment with unsuitable wing sweep. 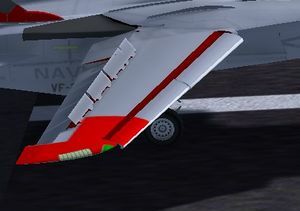 It is possible to land with fully swept wings; however this should only be used in emergency situations as the landing speed is significantly increased. Locked in catapult, flaps set, full afterburner, ready for take-off. Going below deck on the elevator. 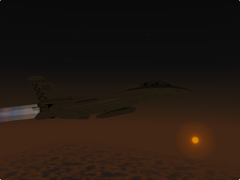 A nice dusk scene with the F-14. 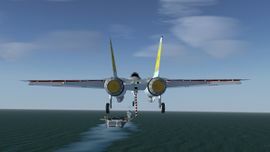 Air-to-air refueling with the F-14B. 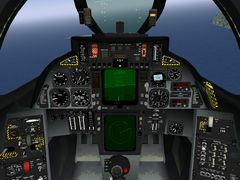 The engines can be quickstarted from the Tomcat Controls menu. To perform a manual engine start, follow the instructions below. It is usual to start the right engine first to ensure that the flight hydraulics system is pressurized first. When the engine reaches 18% RPM push in the appropriate fuel shutoff valve. Repeat the process for the left engine. Ensure that the wings are correctly swept, flaps raised and parking brake engaged. Pull both of the fuel shutoff valves on the glareshield. These are the yellow and black striped items on the glareshield picture. Once the fuel shutoff valve is pulled the appropriate engine will spool down and stop. When both engines are stopped there will be no hydraulic and electrical power and the cockpit will become dark. Ensure wingsweep is set to automatic and wings are not overswept. Select up to 25 degrees of flaps depending on the aircraft weight. Select MIL thrust; or afterburners if conditions dictate. 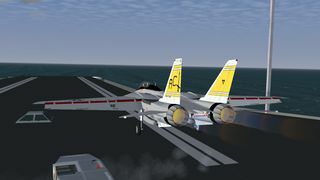 It is usual operating procedure on an F-14B to not use afterburners on take off unless heavily loaded as in the event of engine failure after rotation the resulting yaw moment is likely to result in an uncontrolled departure. At around 145 knots pull back on the stick until the nose raises at which point maintain stick pressure and when 250 feet AGL raise the gear. By 200 knots the flaps should be fully retracted. Note that as the flaps are retracted the longitudinal balance of the aircraft changes and it will tend to pitch down slightly which should be corrected by using the pitch trim. The F-14 has two separate hydraulic systems; identified as the Flight System and the Combined System. The flight system powers the primary flight controls and surfaces, and the combined powers everything else. Both hydraulic systems are powered by engine driven pumps. There are two backup systems for the hydraulics in case of an engine (primary) pump malfunction. The first of these is a Bi-Directional transfer pump that can powere one system from the other system. The second method is an electrically powered pump. The electrically powered pump has its own small reservoir - so once powered on the electrically powered pump should not be powered off as the hydraulic fuel expands and is lost - so there may not be enough fluid remaining in the reservoir to allow the pump to start. When there is insufficient hydraulic power the powered items will no longer function; so in the event of a dual engine flameout the flight controls will be inoperable. Sufficient hydraulic pressure for smooth flight control inputs should be available with one engine windmilling at 18% rpm or two engines at windmilling at 11% rpm. The F-14 electrical system is modeled sufficiently well to provide all visible effects. There is a generator on each engine powered by a Constant Speed Drive (CSD) with emergency hydraulic generator that is powered by the combined hydraulic system. Main generators drop off at 55% N2. Emergency generator drop off at 11-12% RPM. When hydraulic transfer pump operating and sufficient pressure emergency power will drop to 1kVa mode and power only the essential AC and Dc No. 1 buses. In the model on the left main bus and the DC essential bus are used; however upon loss of electrical power from the main bus the non-essential will no longer be powered (e.g. the HUD, VSD, HSD). The main mode is Attitude Hold Mode, Ctrl+t. Other Modes need this main mode activated before being selected. Switching off Attitude Mode disables all other modes . When in Attitude Mode, the autopilot disengages whenever a certain pressure is put on the stick, and it re-engages when the stick is back in the centre position. Attitude Hold Mode will hold pitch attitudes up to plus or minus 30 degrees, and bank angles up to plus or minus 60 degrees. It shall be switched off for aerobatics and inverted flight. 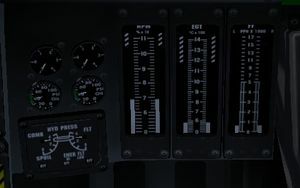 Once in the Attitude Mode, you can select Altitude Mode by hitting Ctrl+a, then the AP REF indicator, (left of the VDI) will illuminate, when at the desired altitude using normal stick control, engage by hitting * (asterisk). The autopilot will then maintain your altitude. Once in the Attitude Mode, you can select Heading Mode by hitting Ctrl+h. After manoeuvring the aircraft into the desired reference heading, release the control stick at a bank angle of less than 5 degrees. The autopilot will then hold the aircraft on the selected heading. To follow a route manager route; activate the route from the route manager and press Ctrl+h a second time or select "GT" on the AFCS panel just below the throttles. Autopilot needs SAS channels to be engaged, which is the default. SAS Pitch and Roll channels may be disengaged by actuating switches located on the AFCS (Automatic/Analog Flight Control System) panel. The APC is a closed loop system that automatically regulates basic engine thrust to maintain a specific indicated airspeed - which is usually used to maintain the correct approach angle of attack for landing. The APC can be used at any time to maintain the current airspeed. Type Ctrl+s to toggle the APC on/off. APC is also disengaged by setting the throttles to MIL, (98 percent rpm) or idle, (68 percent rpm) or raising the landing gear handle or when weight on the wheels. When disengaged the AUTO THROT caution light, (on the left side of the HUD) illuminates for 10 seconds. 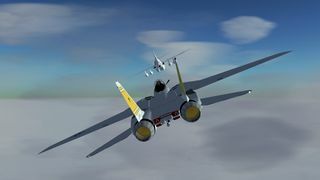 Each wing has a set of spoilers that are used to augment the roll rate during normal flight controlled by the CADC when wings are swept forwards more than 55 degrees. The spoilers can also act as brakes to provide extra retardation upon touchdown. To engage ground spoilers set the ANTI SKID SPOILER BK switch on the bottom of left vertical console to BOTH or use Ctrl+y. After touch down and the throttles pulled to idle, then the spoilers are fully deployed. At the moment, only the gun and the AIM-9s are operational, others ordinances are displayed under the wing, their weight is correct but they aren't usable. Select HUD A/A Mode on the Display panel, on pilot's right console. A multikey shortcut is also available :AHa. 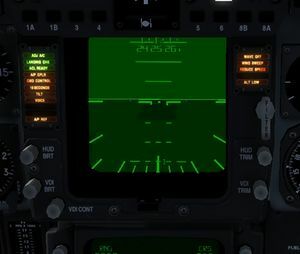 Having the HUD in this mode is not mandatory however when the HUD is in the right mode the guidance symbology will assist with target identification and aiming. Select Gun mode with the Stick Weapon Mode Selector (w). A pipper, the G symbol with a number showing approximately the remaining rounds x 100 and a closure rate scale are displayed in the HUD. The closure rate scale is active only if a target is locked by the radar with TWS AUTO mode (diamond on the HUD). Switch Master Arm on cycle with CTRL-w, the X on the G symbol means Master Arm off or in training mode. Press e to fire the gun. Sidewinders: Crudely modeled on AIM-9L available data. 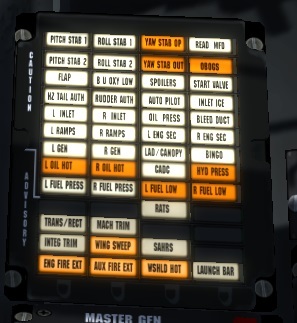 Select a weapons set using the menu: Tomcat Controls > Fuel and Stores: "FAD light" has 4 sidewinders, "FAD", "FAD heavy" and "Bombcat" have 2 of them. Select HUD A/A Mode on the Display panel, on pilot's right console. A multikey shortcut is also available (:AHa). Select SW mode with the Stick Weapon Mode Selector (w). Switch to the RIO view (Ctrl+v). Select pylons 1 and 8, down position, on the Armament panel, on RIO's left console. 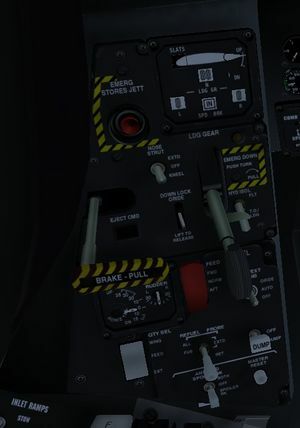 A shortcut toggles these two switches so you can select or deselect all AIM-9 in one keyboard stroke (Ctrl+m) without leaving pilot's view. Switch back to the pilot's view (Ctrl+v). Switch Master Arm on, you hear the search signal of the seeker head, a low volume buzz sound. Now prior to be fired, the AIM-9 must have a lock on a target. Multiplayers, AI aircraft, and AI tankers can be locked. The minimal lock distance is 10 NM, the target must be approximately inside a 80° cone centred on datum line. When locked, the signal buzz volume becomes louder. For best results try to shoot (e) at a 3 to 6 NM range and with the target centred on the aircraft velocity vector. The missile will explode at the smaller distance possible. However if this distance is above 70 meters, it will continue its trajectory without guidance. A tutorial video explaining how to fire the F-14B's missiles. 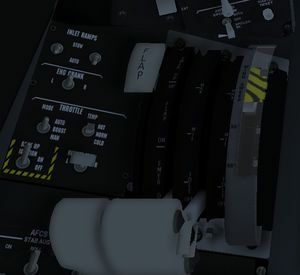 The Display Control Panel is located on the right side of the pilot's main panel, under the Hook lever. The 3 botom switches respectively turn the VDI, HUD and HSD displays on/off. The HSD MODE switch is also available, it selects NAV or TID or ECM mode. This can also be achieved by cycling through these 3 modes with the h key. VDI: Vertical Display Indicator. Shows the aircraft attitude in roll and pitch, with an artifitial horizon and magnetic heading. 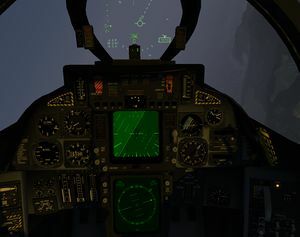 in TID mode (Tactical Information Display): an horizontal representation of the tactical situation (that is information provided by the RIO from what he sees in his radar displays). in ECM mode: a representation of radar threats around the aircraft. Located on the RIO's left console, 3 bands: 30-88 MHz, 108-174 MHz, 225-400 MHz. Modes TR and TR-G set COMM1. Mode DF sets NAV1, that is Direction Finder displayed with the single needle in both BDHIs (Bearing, Distance, Heading Indicator) . You have Comm *or* DF. Storing frequencies (up to 20 channels) a - PRESET select the desired channel, b - READ tune the desired frequency, c - LOAD stores the frequency in the previously selected channel. Located on the pilot's left console, 225-400 Mhz. ADF is not enabled on this radio. Dual control over Multiplayer allows a RIO to operate the radar range and mode. On the ground during the startup phase the pilot handles all of the engines, control surfaces, and other on-board checks and the RIO looks after radar and a few other systems. The RIO usually does most of the communication with ATC. The RIO will find the targets and designate them; it's then up to the pilot to check that it is the correct target and release the weapon. After weapon release it becomes the RIO's job to perform laser guidance and monitor the missile progress. Within Flightgear the target designation is automatic as most of the time you don't have a RIO. Keeping a good watch on the Radar and ECM screens and out of the window. Advising the pilot of fuel status, and monitoring the airspeed and altitude (especially during an engagement with another aircraft). Voice comms using FGCOM or another method is recommended as things happen too quickly for text chat to be much use (and besides the pilot will usually be busy with the controls). YouTube video about F-14 air combat maneuvering against the T-38, A-4 and F-4 at Naval Air Station Miramar, San Diego (the real TOPGUN). This page was last modified on 14 September 2018, at 07:27.